'Caumsett', the Marshall Field III estate designed by John Russell Pope between 1921 and 1925 in Lloyd Harbor. Click HERE and HERE for more on 'Caumsett'. 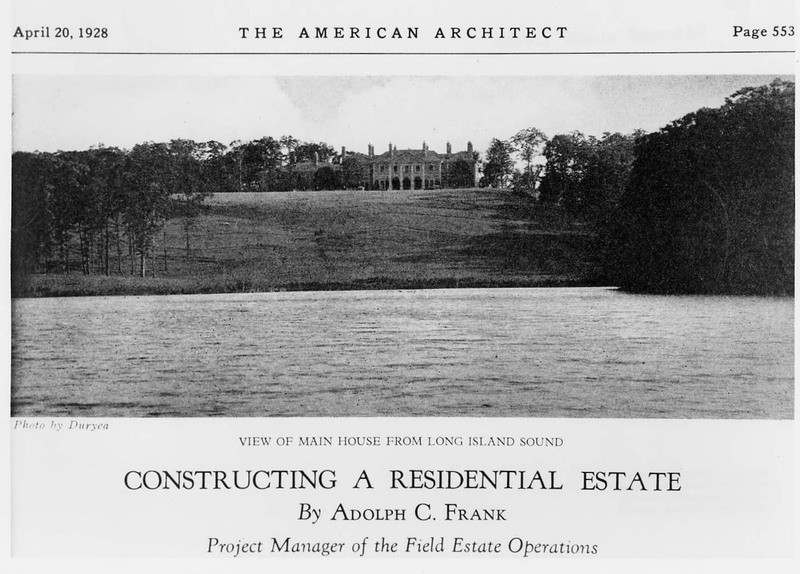 Photo from The American Architect, 1928. See "A Grandchild Remembers Caumsett" by Barbara Bliss. Ancient - Thanks for the link. (2nd Mrs. Marshall Field III), Albert Gould Jennings (highlighted in yesterday's Daytonian in Manhattan post) and Walter Burr Jennings?? The second Mrs. Marshall Field was Audrey James, not Jennings. She was the daughter of Mrs. Willie James an American heiress who was one of the inner circle of King Edward and Queen Alexandra. Audrey was first married to Dudley Coats, and after her divorce from Field, to Peter Pleydell-Bouverie (whose next wife was also named Audrey). The Pleydell-Bouveries open up about 96 degrees of separation, so I'll just do a couple of highlights. Peter Pleydell-Bouverie's cousin, David Pleydell-Bouverie was one of Alice Astor's husbands, and later, more interestingly, at his ranch in California, the landlord of the great food writer M.F.K. Fisher (here, DED pauses to genuflect at the mention of Mrs. Fisher). So, we'll leave the Pleydell-Bouveries for a moment, having established that Audrey was a James, not a Jennings---although it is worth menioning that her brother, Edward James, created the great surrealist garden Las Posas in Mexico, as well as having been married to the dancer Tilly Losch, whose footprint James had woven into a carpet at the family castle in England. This creative Edward James should not be confused with Edward James, the amazingly architectural couturier. But I digress: I resorted to Google to try to figure out how, or if, Walter Jennings and Albert Gould Jennings might be related, with no luck, although interestingly, Walter Jennings brother was named Oliver Gould Jennings. Going back two generations didn't unravel it. LOL - Ok thanks - I knew to expect some digressions, but yes, best not to get into the P-Bs because that could go on for awhile. Thanks for clearing up the 2nd Mrs. Marshall Field - the Caumsett website says that she was Audrey Jennings, Standard Oil heiress, which I had not heard before so that was one question. I also had no luck with Walter Jennings and Albert Gould Jennings, but there was an Oliver Jennings of Dark Hollow - son of Walter, named after uncle maybe? The Daytonian in Manhattan post on the A.G.Jennings house mentions a son Wyllys Burr Jennings, a pilot killed in WWII, so it seems there is some connection there somewhere between the "lace" Jennings and the "oil" Jennings and Goulds and Burrs. Sea Captain Abraham Gold Jennings was married to Anna Burr in 1807. They had ten children. Their seventh child was Abraham Gould Jennings, who started the lace business later inherited by his son Abraham Gould Jennings who built the house featured in Daytonian. Their ninth child was Oliver Burr Jennings, who was the father of both Walter Jennings and Oliver Gould Jennings. So, I believe the answer to your question about the relationship between Walter and Abraham of the town house is that they were first cousins. Not incidentally, Oliver Burr's daughter---Oliver Gould's and Walter's sister Emma--married Hugh Auchincloss Sr., whose son Hugh Jr. would become Jacqueline Kennedy's stepfather. And it was Audrey's father, an heir to the Phelps-Dodge fortune, not her mother, who had all the American money--my mistake. "Mr. Gould was a descendant of two notable families of New England. Major Nathan Gold, the pioneer, was a man of great force of character, who came from St. Edmondsbury, England, to Fairfield, Conn., about 1646. His son, Nathan Gauld, jr., rose from town clerk of Fairfield to become Deputy Governor in 1706 and Chief Justice of the Supreme Court of the State in 1724. Several of the family were soldiers in the American Revolution. The wife of Col. Abraham Gold, Jay Gould's great grandfather, was Elizabeth Burr, whose ancestor was John Burr, an emigrant to America in 1630 with Governor Winthrop, and one of the eight founders of Springfield, Mass. The Burrs included many soldiers, judges, and public officials of good repute. Col. Abraham Gold, the first of his line to spell his name Gould, was killed at the head of his regiment, the 5th Connecticut, at Ridgefield, Conn., while repelling the British raid on Danbury; and his sword, stained with British blood, is to this day in the possession of Abraham Gould Jennings, of Brooklyn, N.Y."
Jay Gould and the Jennings. I'll be darned. (and in the course of sorting out the Jennings relationships, I did find that there was the above mentioned earlier joining of the Gould and Burr families, fifty years before the Jennings connection). Very complicated stuff. Sometime I'll explain my four degrees from Edwin Lutyens for you.